Underground water storage is rapidly growing in popularity as people move toward sustainable water usage and block sizes decrease. 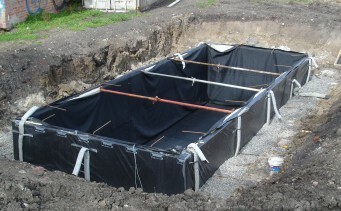 Our underground and underslab water storage systems allow for high volume water storage while using little to no space. When building from new you can utilise the the area under the garage as your water tank. By excavating under an average double garage an extra one metre and building the foundations from brick, you can store around 36,000 litres of water. If you manage to achieve the Victorian Governments target of 155 litres per person per day, the average four person family can store almost two months of water. Where the option doesn’t exist to put your tank under the slab, you can always put it under your yard. When building these style tanks you need to consider the structure to support the weight of the dirt which will be place back on top. 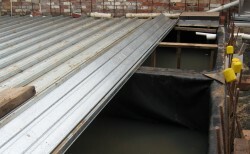 You can use a system similar to that of an underslab tank where you build walls from brick or tilt panel and cover with a lid prior to covering with soil. The other option for an underground tank is to use an internal structure similar to that pictured here. 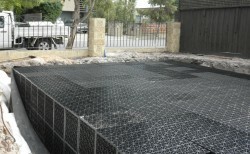 These structural cells come in a range of sizes and can be combined in a variety of ways to achieve the best possible water storage solution for your requirements. When using these structures you can either have a lid made to cover the tank or use a polyester geofabric to allow water too seep back into the tank through the lawn.